Aside from pictures and drawings I had never seen one before so I couldn't be sure. The plastic bag distorted the image but I could still seem to make out what they were. I leaned over the stack of baby bok choi to see if I could get a better look. "Excuse me?" I asked the small, Asian girl behind the counter. She turned towards me as she finished her exchange. This girl's family ran one of the best Asian stalls at the Farmers' Market and often had strange varieties of basil and spinaches that one might be hard pressed to find elsewhere. "Yes?" she asked, pushing her glasses up and moving one of the suspicious bags aside to give herself some counter space. "What are those?" I pointed to the bag. "Oh, these? Rambutans." She pulled out an ovaloid fruit covered in fleshy, pliable spikes. Neon red with canary yellow highlights it looked like one of Jim Henson's muppets had laid an egg. Rambutans, popular fruits of the drupe family, weren't exactly common fair at the Farmers' Market under the freeway. I had never seen one in person and so to come across one here was surprising. "Oh, wow, where did you find these?" I asked. "At the other Farmers' Market. The one down the street." She referred to the what's commonly considered in Sacramento as the Asian Farmers' Market (unless you primarily shop there where it's just the regular Farmers' Market) where ingredients most may consider somewhat foreign can be found; fresh tofu, culantro, Hmong basil, purple snap peas, and melons the size of a 4 year old child could be procured easily. 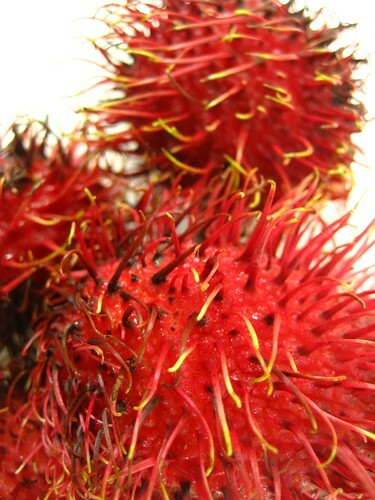 I would visit it every so often to pick up water spinach and herbs but had never come across rambutans there. "I never see these when I go," I exclaimed. "You have to get there early. Even then you have to stock up. We have six more bags of these in our car," she motioned her head behind her and in the corner of the truck sat six bags pregnant with uncountable litters of rambutan. "Damn." Apparently, they were hard to find even if you know where and when to get them. "Hold on," she said and quickly reached over for a bag. She untied it and plucked out five of the plumpest ovals she could find, their spines bending to massage her hands like eager servants. They rolled off her hand into a new bag in a spriteful manner which reminded me of the little puppets running around in opening credits of Fraggle Rock. "Here, try a few," she smiled and handed them towards me. "Oh, I couldn't," I reluctantly waved my hand to protest her kindness. Sometimes I regret those good manners my parents raised me with. "No, I insist. We have tons. We won't miss a few," she pushed the bag forward. I happily accepted. "Wow, thank you! How much?" I asked. "None, you're here every week. Think of it as thanks for your business," she began to prepare a bag of baby bok choi, cilantro, and lemongrass for me: my usual. I handed her $1.20, "Thanks a ton! Can't wait to try them!" "Let me know how you like them!" she waved, turned, and went back to work. When I got home I quickly grabbed one of the rambutans out of the bag. It was soft and the spines felt like rubbery hairs. I quickly produced a pairing knife and cut the entire circumference lengthwise. I knew that anatomically they were like lychees so I let the stone in the center of the fruit guide the knife. 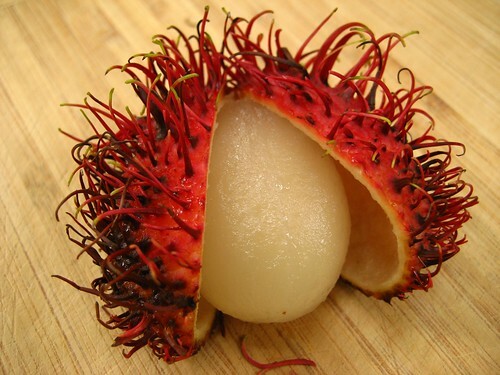 I popped the rambutan open to find an oblong, white piece of fruit; its flesh was translucent and fragrant. I bit in and was surprised how juicy it was but the flesh had a death grip both to its fluids and the stone in the middle. It tasted like a mellow lychee, not nearly as sweet and overpowering which was pleasant as I found lychees to be far to sweet for my taste. It was interesting, funky, a bit acidic and different. A taste that I wasn't going to sing praises of but not speak ill of it either. I think its a flavor you have to grow up with to really appreciate it. I cracked open the rest and plopped them into a bowl. I brought them and a cup of chamomile tea out to the table, the steam from the tea billowing into divining swirls and producing a floral scent. I cracked open a copy of The House on Mango Street and began to enjoy my afternoon, the sweet tea and fruit perfectly complimenting each other and my reading. I decided to just enjoy an hour or two this way. After all, how often do you have a chance to entertain rambutans in your home? I'd suggest buying a big bag. They're oddly blandly addictive, even if you've acquired the taste late in life. I wish I could find them in Columbus (Ohio)! I love rambutan and lychee. When we were touring Hanoi, I saw them everywhere in the street market and commented on how much I loved them and how expensive they are at home. When our guide came to pick us up the next morning for our drive to Halong Bay he brought me a whole grocery sack full. They were fabulous!! Of course I couldn't get them home with me (ag bans) so I ate as many as I could before we left. Garrett, you are truly one of a kind. It is the rare person (besides possibly myself and equally goofy sister) who would compare a fruit with a fraggle! I think it should henceforth be named a Fruiggle. !! I have yet to get my hands on these. When I lived in the Philippines (for six years) I never saw these. It wasn't until I moved to Panama (yes, like the Canal) that I discovered them. They were sold in huge plastic bags by men, women and children on the side of the road (like newspapers, flowers, cigarettes and oranges.) Something like $2 for a full produce bag way back in the early '90s. I asked the Americans driving us around what those were and was told "we call them monkey balls". Hah. The kids loved that and refused to ever call them anything else... so that's what they are to us. I think y'all have an H-mart around there, right? They sell them frozen there and while I haven't tried the frozen variety, I've been tempted when they're off season and my kids are coming home for a visit. They love them so much. An odd childhood memory for them. Fantastic Garrett! This post makes me happy. so glad to see this! I live in nyc's chinatown and see these all the time. I was curious, but never brave enough to try them. 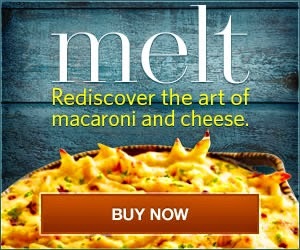 Now I think I finally will! Do do do do do do do--(humming the Fraggle Rock song). I grew up with them as well, but the best ones are the ones I get in Indonesia. You should also try to find some mangosteen, they're delicious. Ooo! I miss fresh passionfruit and fresh jackfruit! I wish they had some around here! And durian--I think I'm one of the few that love it. thanks for letting me know where to get fresh ones! Here in Davis they're definitely not going to show up at the farmer's market, and the only other ones I've seen are canned around here. I love rambutans!!! What an unexpected and exotic treat! I have never seen these before. "She untied it and plucked out five of the plumpest ovals she could find, their spines bending to massage her hands like eager servants." I love this line, Garrett. I learned to love rambutans on a trip to Bali and think they are really cool looking. I even purchased a hand carved tabletop rambutan tree while in Bali. It had about a dozen bright red prickly wooden fruit hanging from the stems. It got beat up during one of my many moves, and I miss that goofy little tree. I've never seen the fresh fruit here in the U.S. so am a bit envious you can find them. Imagine my surprise when you said "Sacramento". I have never seen those at that market either - I guess I'm never early enough! Oh my goodness! 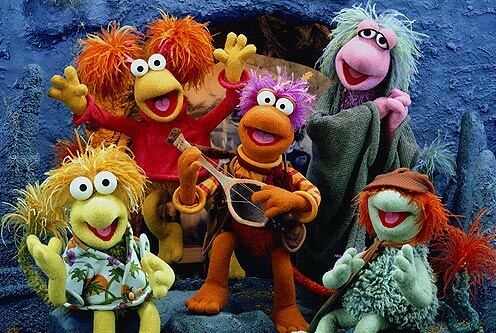 You definately have Fraggles on your blog. That is ridiculous and AMAZING! That made me smile so much. 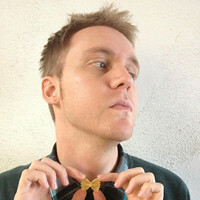 This is a great site, I will spending quite a lot of time here from now on.